Smithsonian Channel, part of the Smithsonian Museum, just announced they will air a documentary November 17, 2013 on the Kennedy assassination attempt. It is called “Kennedy’s Suicide Bomber” and was produced by Raw Cut TV a UK company. I provided much of the information to one of Raw Cut’s researchers many months ago. This movie is based at least partly on my book referenced in the title of this blog posting. The problem is they never notified me of the final production and I’m not sure if they will be crediting me with my contribution. I realize that they almost certainly did additional research but I put them on to many of the sources and also furnished them with so-called rare documents related to this. I am presently making contact with both companies to discuss my concerns. Fortunately I documented my research every step of the way. I also documented all my contacts with Raw Cut. Smithsonian and Raw Cut need to make sure I am credited somewhere in this documentary. That’s all I ask. In any event the show will be great publicity for this “near miss”. 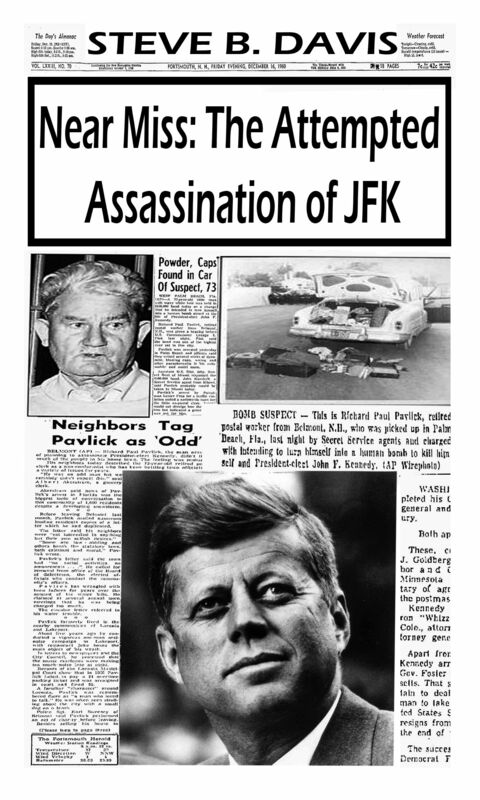 Just remember “Near Miss: The Attempted Assassination of JFK” is the only book ever written concerning this and its potential impacts. The book was published in December 2010 and is available at Amazon, Barnes & Noble, Googlebooks, Kobobooks and others. The author is me – Steve B. Davis. You are currently browsing the WRITINGS & RAMBLINGS blog archives for September, 2013.